Choosing Rottweiler Puppies " "
When looking at Rottweiler puppies, you’d never think that these sweet little dogs grow up into large, powerful canines. 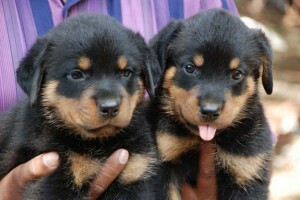 The only characteristics that puppies seem to have in common with standard adult Rottweilers, is their physical appearance (with the exception of size of course). The physical appearance of Rottweiler puppies is something you need to be aware of when looking for that special pup to call your own. The reason is because the breed standard is what separates a dog from being a purebred or a mutt. Every dog breed has their own standard, and the following is the basic criteria for the Rottweiler that you need to look for in your pup. Rottweiler puppies should have a straight, dense and coarse coat of medium length. The coat should lie flat, and the undercoat should be present on the thighs and neck. As the dog grows, the coat will be shortest on the legs, ears and head, and at its longest on breeching. The coat is primarily a solid black color, but features mahogany or rust markings usually on the paws and face. The coloring of Rottweilers is one of the breed’s distinctive features. The head of Rottweiler puppies should be medium in length and is quite broad between the ears. Like the head, the ears are a medium size. The ears fold down, are carried forward, and have a triangular shape. When the Rottweiler is on alert his ears appear level with the top of the skull. The eyes of a Rottweiler are almond shaped and are a nice shade of dark brown. The eyes of Rottweiler puppies convey the dog’s self-assurance and alertness. 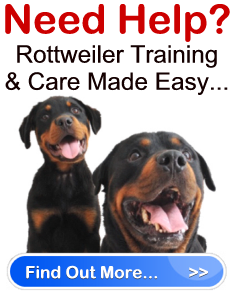 Rottweilers have broad muzzles equipped with strong upper and lower jaws. The jaws should feature perfect teeth that form a complete scissor bite. Like their muzzle, the nose is also broad. The nose should be black and round. The legs of Rottweilers are muscular and heavy boned. The legs should appear straight. The feet of Rottweiler puppies should not turn in or out. The toes are well arched, nails are black, and the pads of the feet are thick. The back feet are slightly longer than the front, and the dewclaws should be removed. In addition, the tail of the Rotweiler is docked. As your Rottweiler pup grows, you will see him develop a powerful body that features a deep and broad chest, straight back, and short, deep, muscular loins. To get a good idea of what the Rottweiler puppies from the litter you are interested in will look like when they are fully grown, find out what the sire and/or dam of the litter look like. The parents of a litter will give you a good indication of how your pup will turn out.